Shinsuke Nakamura vs. Samoa Joe - Who's NXT? Shinsuke Nakamura vs. Samoa Joe – Who’s NXT? With Wrestlemania season just around the corner, speculation about this month’s Royal Rumble is running rampant in the WWE Universe. Aside from an already-loaded card featuring two title matches, the fans are going crazy trying to figure out who will be the annual surprise entrants in this year’s actual Rumble match. I’ll speculate on surprise returns in a later post. Today, I want to talk about stars who haven’t been on the WWE’s main roster before. The company will have to go a long way to top last year’s surprise unveiling of AJ Styles, but it’s possible. When it comes to debuts, there are two types in today’s WWE. The company either takes a performer from NXT (like Baron Corbin or American Alpha) or they bring the star directly into the company (AJ Styles and the team of Gallows and Anderson). This year, someone from Full Sail University (home of NXT) should get the call. In reality, there are a number of NXT stars who could make a big impact on the WWE roster. Bobby Roode, The Revival, or Tye Dillinger could all lend a hand. 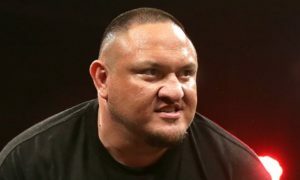 However, when it comes to the current NXT roster, the only two names I’d like to see on Vince McMahon’s speed dial are Shinsuke Nakamura and Samoa Joe. I’m not advocating calling both men up. While that would possibly blow the roof off of the AlamoDome, it would leave the NXT roster seriously depleted. This time around, only one of this dynamic duo should make the jump to the big time. Imagine the Royal Rumble match – the crowd is counting down from 10 and anticipation is building. 3…2…1 – the buzzer sounds and the music hits. Down the ramp storms The Samoan Submission Machine. It’s Joe, and the crowd goes wild. For this Rumble, at this time, Joe is the right one to call up. At this point, Joe doesn’t hold the NXT title. He’s had several matches with Nakamura, and has done his job in helping to elevate the King of Strong Style. There are a couple of viable heels on the roster for Nakamura to battle with (most notably Bobby Roode), and there really isn’t much for Joe to do down in Florida. Joe has history with both Styles and Kevin Owens. While Nakamura has faced Styles in Japan, Joe’s clashes with AJ took place in the US when both were part of TNA. If for no other reason, some fans may be more familiar with the Styles/Joe rivalry. Also, bringing Joe up and putting him in a title feud on either WWE show makes him a strong babyface almost immediately. That’s something that both WWE shows, especially SmackDown, need at this point. Moving Joe up also makes sense because of his mic skills. Both Styles and Owens are great talkers, and putting Nakamura up against either of them would diminish his appeal, given his limited grasp of English. Unless WWE wants to put Nakamura with a mouthpiece, there’s no way he could hang in a promo battle with either of the current champs. Shinsuke seems more like a solo act to me. Joe is one of the best talkers in the business, and wouldn’t have to change his persona much to make a babyface turn. Joe could also be used to elevate some mid-card talent on either of the main shows. Joe’s straightforward style would be a good match for a number of guys making their way up the card. Imagine Joe and Baron Corbin in a Last Man Standing match. Joe could make a lot of stars out of guys already on the roster. Nakamura might eclipse most opponents in the midcard. There’s no denying Nakamura’s appeal. His entrance is a thing of beauty, and his time is coming. Shinsuke needs to arrive on his own, and should probably debut in a title match. In my dream scenario, Joe would appear at the Rumble, win the match and announce his intentions to destroy AJ Styles at Wrestlemania. Instead, Joe would shock the world by taking the title from Styles at February’s SmackDown-only Elimination Chamber PPV. Then, Joe would spend the next two months mowing down the rest of the Smackdown roster. In the weeks leading up to Wrestlemania, Styles could demand his rematch, only to be stymied by either John Cena, the Undertaker or both. While this is all going on, Joe is in Shane McMahon and Daniel Bryan’s ears – demanding that the provide him with some worthy competition. This would slowly move Joe out of the babyface realm and edge him toward heel status. Bryan then announces that Joe will defend the WWE title at Wrestlemania against a mystery opponent. During the big show, Joe comes down to ringside, and cuts a killer promo about the lack of worthy challengers to his crown. The lights dim, the violins hit, and Nakamura twists himself into an impossible shape at the top of the ramp. The WWE Universe might never recover. Shinsuke Nakamura and Samoa Joe both deserve to be on WWE’s main roster. With more eyes on the product during the Road to Wrestlemania, it’s the idea time for the company to set the tone for 2017.